I’ve recently been to an Historic vehicle rally at Seaburn, and as usual I came back with a load of photos, some I took and others I bought. But I managed to get hold of one that has eluded me for a while, and that is a colour photo of one of Wakefields Weymann Fanfares. Isn’t that simply glorious, understated, simple, and elegant. Modern designers take note! Lets raise (another) cheer for the Fanfare – or possibly a fanfare for the Fanfare? Super photo. Obviously I’m all for the original and best Reliance version but what else was on offer? Guy Arab LUF, Leyland Leopard (or Tiger Cub). You really couldn’t lose, whichever version you went for. As you will know, David, Wakefields had six on a Reliance chassis, and parent company, Northern had ten on a Guy Arab LUF with Gardner 6HLW engines. Northern specified a lower capacity 37 seat version, at first the were used on extended tour work and spent much of their time away from their home base. Off season, they were frequently to be found earning their keep on the Trans Pennine Liverpool Express route. This was pre motorway days, and any east-west route to Liverpool was a long hard slog. Mechanically, they were well up to the job, and some would argue they offered a degree of passenger comfort that has never been matched. At busy times, they were often joined by their Wakefields cousins, who, along with their Percy Main crews, were drafted in as duplicates on the route. 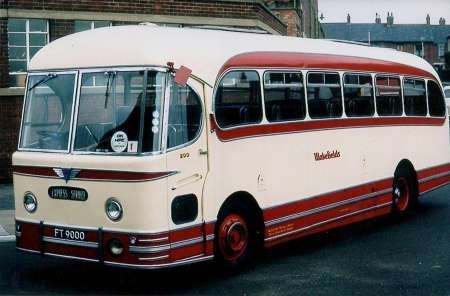 As for longevity, in 1964, all 16 were refurbished by Plaxton, the AEC’s were withdrawn at the end of the 1968 season, and the Guy’s at the end of 1969. It’s such a pity that none seem to have survived into preservation. I’ll happily raise another cheer for the Fanfare any day. I’ll not only endorse Ronnie’s comment about passenger comfort, but for the LUFs on the Tyne-Tees-Mersey express I’ll raise an extra cheer for musical entertainment! Regarded by many as one of the most handsome pre war coach bodies, if my information is correct, Wakefields Motors had four of these C30F Duple Coronations. 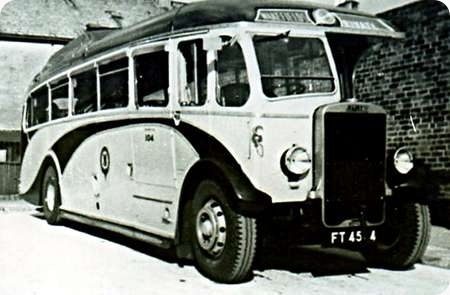 FT 45?4/7 – 104/7, from 1937, were on a Leyland Tiger TS8 chassis. They were followed in 1938 by another four FT 49?? 108/11 but this time they were AEC Regals. 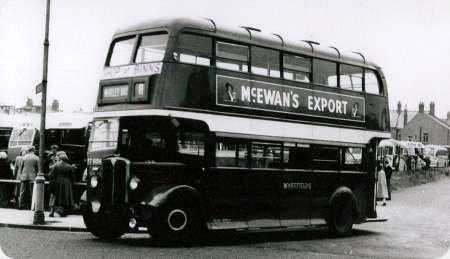 The four Leylands spent some of the war years in Ireland on hire to the Northern Ireland Transport board. As a young boy of eight, I can remember them still being at Percy Main when the Beadle rebodied AEC’s arrived in 1952 & 53, they were eventually replaced by the Weymann Fanfares of 1955. I know many quality pre war chassis were being rebodied at that time, but I don’t know if these were. For those who don’t remember real money, the board at the front of the AEC, two shillings, 2/- is 10p. The AEC is standing at the top of South Parade outside Quickfalls shop in Whitley Bay, who acted as booking agent for Wakefields. After picking up here, the coach would then pick up at Cullercoats, Tynemouth, North Shields and Wallsend. When I was quite young, my parents took me on a half-day tour to Rothbury and Cragside, for which one of the pre-war half-cab coaches was provided, although I don’t recall if it was an AEC or Leyland. For a tour like this going north, it would start in Wallsend with Whitley Bay as the last picking up point. The route then taken would be via Seaton Delaval and the A192 to Morpeth and then I think via Longhorsley, returning via Scotsgap or vice versa. On the return journey, there would be a break at Morpeth. Rothbury was a place we enjoyed visiting, and we used at one time or another all three tour operators from Whitley Bay, the others being Priory Coaches and United. Priory’s booking agent and pickup point was at the foot of North Parade, and as far as I can recall, they provided a Bedford SB coach. United, of course used the Bus Station and regrettably, provided a bus for the tour, admittedly an almost new Bristol LS5G, but still a bus, which did nothing to improve my parents low opinion of United as a tour operator. 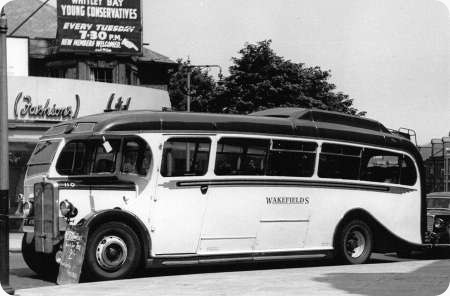 On the whole, we much preferred Wakefields, and over the years travelled on most of their day and half-day tours. Just a shot in the dark on behalf of a friend. Did Wakefields by any chance have a livery of green and cream, presumably before WW2, and did they ever have any of the Northern GT "SE4 or SE6 saloons ?? Any pertinent information would be much appreciated thanks. Chris, this is a round the houses way of saying, I don’t know, but my records would suggest that if the livery was green, it would be pre 1929. Wakefields Motors Limited, were founded in 1919, their depot was in Church Way North Shields. At a date I have not been able to establish, they became a subsidiary of The London North Eastern Railway Company. In 1929, they bought Archer Bros of North Shields, this increased the fleet to 43, 31 buses and 12 coaches, also in 1929, L.N.E.R purchased an interest in the NGT group, the name was retained, but Wakefields adopted NGT livery, and all new vehicles were numbered as part of the Tynemouth & District fleet, but they had a ‘W’ prefix. In 1933, NGT opened a new depot at Percy Main, all T&D and Wakefields vehicles were rehoused there, the remaining Wakefields vehicles were also renumbered. The Wakefields depot was sold off, as was the T&D depot in Suez Street North Shields, but the depot in John Street Cullercoats became the NGT group body and paint shop. Percy Main had eight NGT/SE6 vehicles, FT 3478/3482 – 82/86 from 1935; and FT 3903/3905 – 90/92 from 1936; to the best of my knowledge, none of them carried the Wakefields name. Until 1970, the name was in continuous use on some service buses, and all Percy Main based coaches, in 1975 all P/M vehicles were renamed Northern.